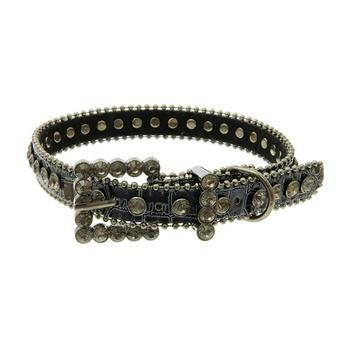 This 'Medium: Navy Faux Leather Belt Design, Crystal Stone Adjustable Dog Collar w/ Bling' is constructed of a high-quality leather. Show off your pampered pooch with this lovely collar. This collar measures 20 inches long and 3/4 inches tall. Not recommended for dogs that are strong pullers.